Turnover. It happens. Staff can come and go with normal attrition, and sometimes will leave because of an internal issue, theirs or yours. But when your key employees- those who stick with you through thick and thin, who are happy to take on projects, sit in on planning, give valuable feedback, have a big picture view of your business- decide to leave it can have an enormous impact on your organization. Why are Key Employees different? Key employees are a rare breed. They have skills, especially in leadership, and although are dedicated to their career, they are usually driven by their work ethic rather than climbing a ladder. Their families or personal lives are of highest priority, which cause them to have great interest in benefits such as retirement and paid time off. They are willing to give extra, even when not asked. Key employees appreciate a strong leader who does not micromanage. 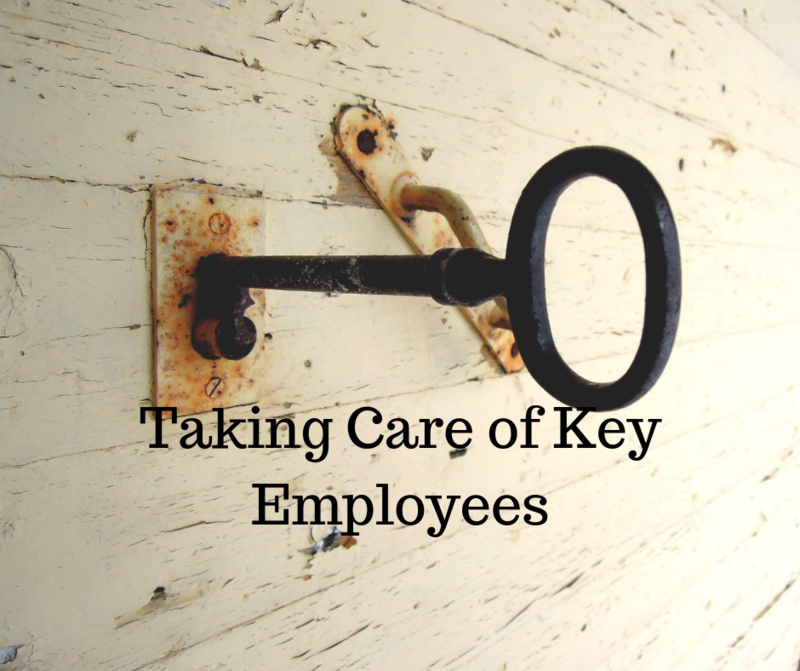 How do I take care of my key employees? It is a good idea to set salary grades with minimums, medians, and maximums for your full time positions based on their job descriptions. Although it is tempting to write job descriptions and set salary based on who is currently in the position, create it as if it were a brand new position. Do the research to find out what the same positions are getting paid in your industry by region. Once your grades are set, you can compare what you are currently paying your people. In the case where someone is getting paid more than the maximum, which may happen to a key employee, consider maintaining their salary but giving them bonuses based on measurable performance for a period of time until their base salary is more in line with industry standards. As mentioned, you can reward key employees with bonus to supplement their base salary. The key is to be crystal clear at the beginning what the goal is, including reasonable timelines and how you will measure the success. Key employees are highly motivated by time off. Since one of their highest priorities is spending time with family, you can offer them more paid time off than other staff. Additional paid time off can also be part of a bonus structure. Although accolades do not always work with key employees, they do like to be appreciated. Instead of saying “thank you”, let them know how much you appreciate the attention to detail they paid on a certain project. Give them feedback about how their work was perceived by the highest levels of management. Try giving them a gift card to a local upscale restaurant so they can go to dinner with their spouse. Mention in a staff meeting that the extra work they did on a project helped it succeed beyond set goals. They are not looking for a trophy. They want to know that the effort they put into c=something made a difference. Talking with your key employees about how their department’s efforts will affect another department is a nice way of allowing them to tie everything in together. Get their opinion on the bigger picture. They appreciate the opportunity to share their thoughts and it shows them you respect their ideas. Allowing your key employees to handle management tasks shows them that you trust them. They appreciate you noticing that they are trustworthy and are usually willing to help out. Start small and incrementally give them more when they have earned it. Why do Key Employees Leave? One of the main reasons key employees leave is lack of equipment or data needed to get their job done. They sincerely want to complete their tasks but when their hands are tied because you have not provided them with the tools to get it done, their levels of frustration go up. Over time they lose interest and will begin to look elsewhere for a position. In order to provide everything key employees need, you may need to look outside the organization for help. Some tasks, including database building, list cleansing, and telemarketing for lead generation, can be outsourced to streamline operations and save time, allowing you and your staff freedom to get your key employees what they need to really make a difference and help you succeed.